Quite often, I am asked, “What is your favorite restaurant”? Though I have many favorite restaurants throughout the valley, the best dining experiences I have had, have not been held at traditional dining venues. 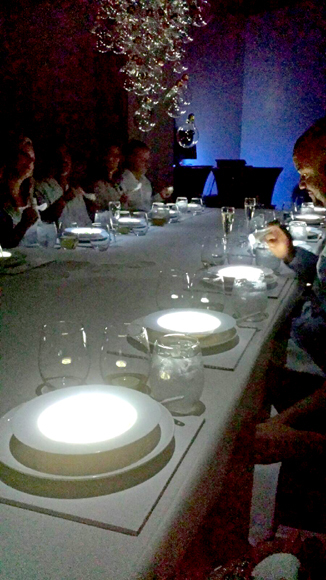 I have often bragged about my dining adventures with PS Underground but their recent event, “Light” simply blew me away! Every time I attend one of their events, I am more impressed than before, and to be honest, I’m not sure how they are going to top this one. 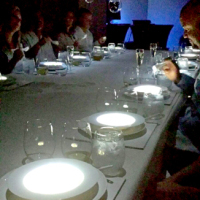 If you are one of the few that have not heard of this underground supper club, allow me to introduce you to the concept. Events are posted on their website and Facebook page where one can reserve a seat. Space is limited, often times between 15 and 20 guests. No details are provided until the evening prior, and all dietary restrictions are to be declared at the time of reservation online. Once the location and instructions are announced, the fun begins. Until then, it is a complete mystery. It is certain to be unlike anything you have ever experienced before. My guest and I attended, “Light” this past weekend and I still get chills recalling the evening. We arrived promptly for a reception and enjoyed a glass of champagne and passed hors d’oeuvres while we mingled with other guests. The anticipation filled the air and we had no idea what to expect. When it was time to begin, we were ushered to a separate room. Before us was a single dining table for the entire group, immaculate and white. Atop the long community table were two lovely young women, dressed in white, lying across the center. As we were seated, they seemed to “awaken” and provide us with our napkins. They continued to provide service to the guests, pouring wine and even feeding us grapes. 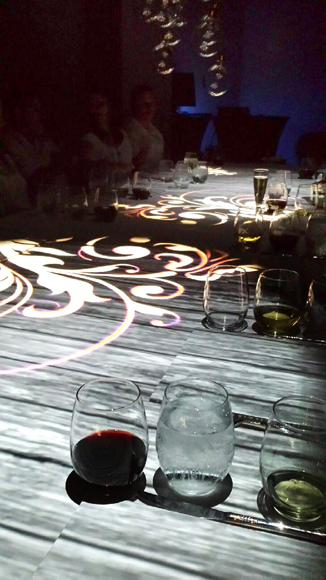 The music was calming and seemed to match the ambiance at every course of the meal. The elegance of the scene was soothing and tranquil. 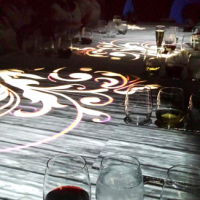 Though the room was bright and mostly white, little did we know that throughout the evening, vivid lights and patterns would be displayed across our table and place settings, illuminating each course while providing an artistic captivating fanfare. 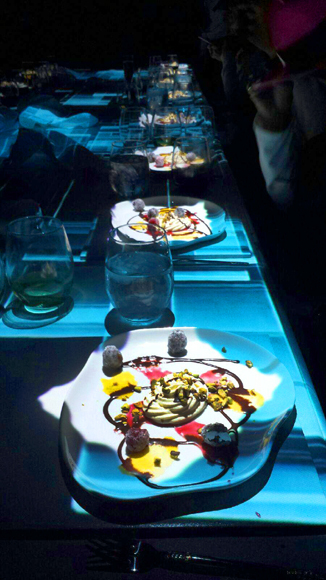 Between courses were surprises that would engage the guests and leave us in awe. We were entertained with smooth jazz from a brilliant saxophonist and dazzled by the vocals of a superb tenor, belting out a little opera for us. It was truly, “dinner and a show” as usual. 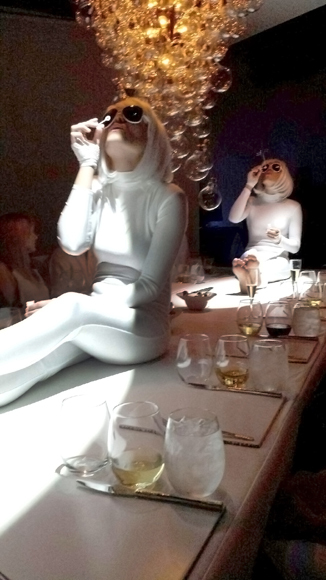 Our ladies in white contributed to the festivities with dancing and blowing bubbles. They kept the magic alive from start to finish. The talent did not stop with service and entertainment. The meal I received was truly remarkable, of the highest quality available. 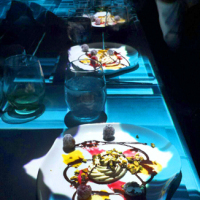 We received six gourmet courses, masterfully plated and presented. Our first course was an Heirloom Tomato and Hearts of Palm Salad with fresh herbs and a touch of Saguaro Cactus Vinegar and Hawaiian Pink Sea Salt, garnished with a tomato powder. The tomatoes and herbs came straight from the local garden of the chefs and owners, Michael and David. We followed this dish with a Roasted Peach Soup with Applewood Smoked Bacon and crispy fried Arugula. The sweet and savory puree was addicting! After our starters, we received a Slow Baked delicate fillet of Corvina. The fish was served over Rutabaga and Turnip puree, finished with Lemon Beurre Blanc, accented with a Squid Ink Beurre Blanc. Before our main course would arrive, we cleansed our palates with some fresh locally grown fruit including citrus and kiwi, contrasted by mild pink peppercorns. It was a surprisingly intriguing pairing! Our main dish was Seared Cervena Venison over wild rice pilaf with roasted vegetables. The venison was tender and seasoned to perfection, completed with a sweet Cumberland Sauce. I would say that I could not believe the magnificence of the meal served to us, but I have dined with PS Underground several times and the quality is consistently top notch! The dessert was constructed in an assembly fashion at the table before us. A smooth Tangerine Mousse with crushed, roasted pistachios and candied berries. This production was quite the finale to a show I will not soon forget. When one attends a PS Underground dinner or brunch, he or she is certain to leave with new friends and a great story to share. If you have been waiting for the best time to see what everyone is talking about, visit www.psunderground.com and reserve today. With the holidays upon us, gift certificates are available and they are better than any restaurant gift certificate in the entire valley. Period. Like them on Facebook to learn of upcoming and past events.